Theresa May has told the Commons liaison committee that later this she intends to announce a long-term plan to boost NHS funding, so that it is no longer dependent on annual top-ups. Suggesting that the money would come on stream this year, she said: “I would suggest we can’t wait until next Easter [when the next financial year will start].” At the weekend a report in the Sunday Times (paywall) said there was a plan to announce an extra £4bn for the NHS annually in the summer. May was not asked about this figure, and did not suggest how much extra the NHS might get. She was also not asked about reports the government is considering introducing a new hypothecated tax to fund the increase. May hinted that the government has now realised that setting up new customs arrangements after Brexit could take longer than expected. This is what she said in response to a question from the Conservative Nicky Morgan, who said HM Revenue and Customs told her Treasury committee that a new customs partnership with the EU could take five years to set up. We are looking at different potential customs arrangements for the future in order to deliver on the commitments that we have made. We are now the point at being able to look in more detail with the European commission at some of those proposals. And I think it is fair to say that, as we get into the detail and as we look at these arrangements, then what becomes clear is that sometimes the timetables that have originally been set are not the timetables that are necessary when you actually start to look at the detail and when you delve into what it really is that you want to be able to achieve. 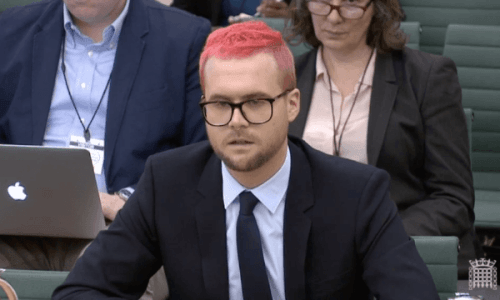 There was a “common plan” to use the network of companies orbiting Cambridge Analytica to get around election spending and co-ordination laws, Christopher Wylie, the Cambridge Analytica whistleblower, has told a parliamentary committee. Mark Zuckerberg has come under intense criticism from the UK parliamentary committee investigating fake news after the head of Facebook refused an invitation to testify in front of MPs for a third time. Restricting immigration from Europe after Brexit is very likely to lead to lower growth in total jobs and in the output of the UK economy, the government’s official migration advisers have said. Jacob Rees-Mogg has issued a thinly veiled warning to Theresa May suggesting she would be ousted by the Conservative party if she failed to deliver on her original Brexit red lines. Boris Johnson has apologised after referring to the shadow foreign secretary, Emily Thornberry, as “Lady Nugee”. As Patrick Wintour reports, the Speaker of the House of Commons said the references, in relation to Thornberry’s husband, Sir Christopher Nugee, were sexist and inappropriate. Here is the BBC’s Laura Kuenssberg on May’s NHS announcement. Here is the full quote from Theresa May on NHS funding. May says she wants to build a consensus on NHS funding in parliament. But she knows that is not always easy. Sarah Wollaston, the liaison committee chair and chair of the health committee, goes next. She asks about the call in a letter for a commission on NHS funding backed by committee chairs and others. May says she shares much of the diagnosis in the letter. She says funding is not the only issue. But she does want to come forward with a long-term funding plan for the NHS. She says she does not think it should have to rely on annual funding top-ups. But she says she does not think having a commission (the proposal in the letter) is the right way ahead. May says she wants to produce a long-term plan to improve NHS funding. It should not be reliant on annual top-ups, she says. Hilary Benn, the Labour chair of the Brexit committee, goes next. Q: The EU wants to exclude the UK from Galileo after Brexit. It has been reported that the UK will be excluded from contracts from this year. Is that consistent with the good faith provisions in the transition deal? May says the UK is talking to the EU about this. Q: HMRC said the new customs partnership with the EU you proposed (one of two customs options in a paper published last year) would take five years to set up. May says the government is just now getting to the stage where it can discuss customs options with the EU. Sometimes at this point you realise plans might take longer than expected, she suggests. May suggests government’s post-Brexit customs plans could take longer than expected to set up. Nicky Morgan, the Conservative chair of the Treasury committee, goes next. Q: What do you feel about overseas states setting up Twitter accounts to threaten candidates, even threatening to have them killed? May says a vitriol has come into politics which is wrong. Q: There is a particular concern about deliberate orchestration by an overseas state to undermine democracy. I assume that would be of great concern to you. Of course it would, says May. Mary Creagh, the Labour chair of the environmental audit committee, goes next. Q: Boris Johnson says when the UK leaves the EU it can get rid of burdensome regulations. But Michael Gove says he wants tighter environmental regulations. Which is it? May denies there is an inconsistency. Q: Can you comment on reports that officials are looking at an Irish border solution that would keep the UK aligned to a sub-set of single market rules? Does this mean you are more serious about option 3 as a solution to the border? May says option 3 is still very much the backstop. She says the UK wants to find a solution through the new trade relationship. Andrew Murrison, the Conservative chair of the Northern Ireland committee, goes next. Q: Do you worry that not having a Northern Ireland executive makes it harder to take its interests into account for Brexit? May says she wants the executive to be restored. She says civil servants from Northern Ireland have attended joint ministerial committee meetings. She says she is interested in what else can be done to ensure Northern Ireland’s interests are taken into account. Neil Parish, the Conservative chair of the environment committee, goes next. Q: For perishable goods, the ability to cross borders quickly is essential. What is the government doing to ensure that? May says she wants borders after Brexit to be as frictionless as possible. May says she supports her independent local butcher rather than going to supermarkets. Q: There is real anger about what has happened to fishing. Can you say that fishing rights will not be traded to get a final deal? May says she understands the anger people felt about how the interests of fishing communities were sacrificed when the UK joined the EEC. She wants to do it differently this time. Scottish fisheries can be confident that, in 2020, the UK will be negotiating for the 2021 catch as an independent state. And the government wants to rebuild the industry. That includes the fish processing industry too, she says. May says she wants to ensure there are no unintended consequences to what gets proposed by the UK government. She says she thinks there is goodwill on both sides. The committee is now on Brexit. Pete Wishart, the SNP MP goes next. He asks about devolution and the EU withdrawal bill. May says further work is still being done to try to find a solution (as to what to do about powers being repatriated from the EU which would normally be devolved) acceptable to the devolved administrations. She says the government’s priority is to maintain the integrity of the UK’s single market. May says that to say it is disappointing that the international development committee were not issued with visas so they could visit Myanmar to investigate the plight of the Rohingya is to put it mildly. She says she hopes people will continue to highlight this issue. Q: You say you have not seen evidence of Russia interfering in elections. Have you looked for this? May says she does not look for things herself. That is for others. Q: But have you asked government agencies to look at this? May says at the time of the election work was done to ensure the integrity of elections. May says what is important is that the Electoral Commission look at this. Q: So you are not ordering an investigation? May says the Electoral Commission are looking at this. Q: We have invited Mark Zuckerberg to give evidence to parliament. He has offered to send someone else. Do you think it would be appropriate for him to appear? May says this is an important issue. The committee should get the maximum committee to ask questions. Q: So should he turn up? May says Zuckerberg will decide for himself. But she hopes Facebook recognises why people are concerned about this. Damian Collins, the Conservative chair of the culture committee, goes next. Q: Do you accept the claim in the Robert Mueller indictment in the US that the internet research agency in Moscow is funded by the state. May says she will have to wait for Muller’s report. Collins says the claim is in Mueller’s indictment. May says, if that is the case, she accepts that he must have good evidence for it. May says she has not seen evidence of successful Russian interference in UK democratic processes. Q: What do you mean by successful? May says she has not seen evidence of Russian interference in British democratic processes. Q: My committee has difficulty getting tech companies to comply. When we ask for information, we don’t know if they are giving us all they have. Do you support calls for the information commissioner to have stronger powers? May says the reports about what has been happening at Cambridge Analytica raise “deep concerns”. Q: Have you considered increasing the number of British troops deployed in Europe? May says troop levels are kept under review. But it is not just a UK matter. Other countries deploy in Eastern Europe too. Julian Lewis, the Conservative chair of the defence committee, goes next. Q: Given the situation with Russia, shouldn’t the government be cutting the BBC Russian monitoring service. It has been cut by £25m. That is a relatively small sum, he says. May says the Foreign Office is in discussion with the BBC about higher funding for the World Service. Lewis says that relates to what is broadcast into Russia. He is talking about the monitoring of what comes out of Russia. He urges May to consider this. This is from the Mail’s John Stevens. Yvette Cooper, the Labour chair of the home affairs committee, goes next. Q: Some 700 Russians have been granted tier 1 investor visa (which are available to those investing £2m in the UK). Are those being examined to see if the money was legitimate? May says the Home Office is reviewing the system. Q: But are the individuals being looked at? May says she thinks the system is being looked at. Q: If those 700 have not been looked at, some of those people will get indefinite leave to remain. Isn’t that a problem? May says there have been various question about the scheme, not just about whether the money is illegal. Q: How can political parties be sure donations are legitimate if individuals are not checked? May says there are clear rules about political donations. Tom Tugendhat, the Conservative chair of the Commons foreign affairs committee, goes first. Q: Russia has just held a debt auction. Half the debt has been brought by people in the UK. May starts by updating MPs on the latest Russian spy expulsions. She says a further seven countries have now expelled Russian diplomats. May says 25 countries have now expelled Russian diplomats in response to the Salisbury nerve agent attack. She says Nato has also reduced the size of its Russian delegation, from 30 to 20. Theresa May is about to give evidence to the Commons liaison committee, made up of the chairs of all the Commons select committees. The hearing will last for 90 minutes and, according to the committee, cover these four topics. But Ben Bradshaw told MPs that Damian Collins, the culture committee chair, intends to raise the Vote Leave allegations too. Black Cube has always operated within the boundaries of the law in every jurisdiction it operates, following legal advice from the world’s leading law firms. Whilst we are flattered that we are seemingly being connected with every international incident that occurs, we will state that Chris Wylie’s testimony is a flagrant lie. We categorically declare that neither Black Cube, nor any of its affiliates and subsidiaries, have ever worked for, or engaged with, SCL, Cambridge Analytica, or any of their affiliates and subsidiaries. Black Cube has never operated in Nigeria nor has it worked on any project connected to Nigeria, and none of its employees have ever set foot in Nigeria. We have had to take down more comments than usual today. When commenting, please keep Point 6 of our Community Standards in mind: We will remove any content that may put us in legal jeopardy, such as potentially libellous or defamatory postings, or material posted in potential breach of copyright. Davey criticises Boris Johnson, the foreign secretary, for issuing a statement at the weekend dismissing the allegations against Vote Leave as “ludicrous”. He says he wants to know if Johnson was speaking for the government. Labour’s Ben Bradshaw intervenes, and says Johnson posted his tweet before he would have even had time to read the allegations in full. Here is the Johnson tweet. In the debate Sir Ed Davey, the Lib Dem former cabinet minister, is speaking now. He says the Electoral Commission apply three tests to decide whether campaigns have colluded in a way banned by election spending rules. Did they coordinate their campaign materials? Did they coordinate their campaign activities? And did one campaign have the power to approve what another was doing? All three of those conditions apply in this case, he says. Here are the main points from Christopher Wylie’s evidence to the Commons culture committee. Wylie is the whistleblower and former Cambridge Analytica employee who has revealed how Cambridge Analytica, the data analytics company that was part of the SCL political consultancy, exploited Facebook data and how it was linked to another firm, AggregateIQ, that worked for Vote Leave in the EU referendum campaign. Wylie claims to have documents showing Vote Leave broke election spending rules – an allegation that those who ran the campaign have strongly denied. Wylie was taking questions for almost four hours and he did not lose his composure or get flustered at all. His comments were striking, even shocking at times, but his demeanour was measured and matter of fact. Overall, he seemed to strike the MPs as a plausible and impressive witness. Wylie said that he thought “cheating” by the Vote Leave campaign may have swayed the result of the EU referendum. I think it is completely reasonable to say there could have been a different outcome of the referendum had there not been, in my view, cheating. He said AggregateIQ (AIQ) was clearly part of SCL and Cambridge Analytica. AIQ claims it is a separate entity, but those were “weasel words”, he said. He said AIQ was unethical. AggregateIQ, in part because it was set up and works within the auspices of Cambridge Analytica, inherited a lot of the company’s culture of total disregard for the law. He said he believed AIQ had got the data it used during the EU referendum campaign from Cambridge Analytica. He said he was “convinced” that Vote Leave worked with other leave groups to circumvent election spending rules. The other groups, BeLeave, the DUP and Veterans for Britain, spent campaign money with AIQ, he said. When you look at the accumulation of evidence, I think it would be completely unreasonable to come to any other conclusion other than this must be coordination, this must be a common purpose plan. He also said that someone at the AIQ office told him that was was going on was “totally illegal”. He said that there was a “clear reporting structure” between Vote Leave and BeLeave, even though BeLeave was supposed to be a separate organisation. They were also based in the same HQ, he said. He said AIQ has remarkable conversion rates for the digital advertising they were using during the EU referendum campaign. They had conversion rates of between 5% and 7%. That means between 5% and 7% of people targeted responded positively to what they say and acted upon it, he said. He said that was much higher than is usual for digital advertising or campaigning. He said SCL was an unscrupulous organisation that undermined democratic institutions around the world as it engaged in commercial campaigning. You have to remember this is a company that’s gone around the world and undermined democratic institutions in all kinds of countries. They couldn’t care less if their work is compliant because they like to win. He said that, in a campaign in Nigeria, the company had used violent videos to intimidate people. The company utilised the services of an Israeli private intelligence firm, Black Cube. Black Cube on the Nigeria project was engaged to hack the now-president Buhari to get access to his medical records and private emails. AIQ worked on that project. AIQ was handed material in Nigeria from Cambridge Analytica to distribute online. That’s distribution of kompromat and of incredibly threatening and violent video content which I’ve passed on to the committee. The videos that AIQ distributed in Nigeria with the sole intent of intimidating voters included content where people were being dismembered, where people were having their throats cut and bled to death in a ditch, they were being burned alive. There were incredibly anti-Islamic and threatening messages portraying Muslims as violent. He said there were links between SCL and the Russian oil firm Lukoil, which he said was linked to the Russian FSB security agency. He said he was aware that Lukoil had been told that Aleksandr Kogan – the Cambridge academic who developed the app allegedly used by Cambridge Analytica to gather data about Facebook users – was a regular visitor to Russia. I’m not saying that Alexander Nix [the SCL/Cambridge Analytica boss] or Aleksandr Kogan or anybody involved knowingly colluded with Russia to undermine the American election. I am saying there was a very significant risk that was created by notifying this company not only of the existence of this data but telling them that the person in charge of this data was operating in part out of Russia. It would make it incredibly easy for them to get access to this data. For me, that’s concerning and I think it should be looked into. He said SCL were making their money not just by political consultancy but by “capturing” governments. Part of the business model of SCL is to capture a government, win an election. You get paid for that but you don’t get a ton of money. Where you get money is then going to the minister and introducing the minister to a company and then making deals. There were different companies interested in building ports and things like that and in order to get a competitive advantage, some money goes here and some money goes here, and you can introduce the company to the minister and the minister approves the project and you get a cut of that deal. He accused them of having a colonial mindset. You can be like a colonial master in the country. It felt very much like a privatised colonising operation. You would go into a country that has underdeveloped civic institutions, you would exploit that and make money out of it. That’s how they make a lot of their money, through exploiting relationships and the fact that there’s not a lot of oversight and government accountability in a lot of these countries. It’s very easy to make a lot of money like that. The key thing is you have got to have your guy in power. Frankly, yes. Nothing good has come from Cambridge Analytica. It is not a legitimate business. SCL is not a legitimate business. I don’t think that they should remain in business. The Labour MP Ben Bradshaw is speaking in the debate now. He says when he started raising concerns about the conduct of the EU referendum campaign in the Commons he was regarded as “a crank”. But almost all the allegations he made have now been substantiated. He says anyone in any doubt should watch Christopher Wylie’s evidence to the Commons culture committee today. He says Wylie was an impressive witness, and produced evidence of serious law breaking. He praises Damian Collins, the culture committee chair, for taking these allegations seriously. Collins will be putting them to the prime minister at the liaison committee hearing this afternoon, Bradshaw says. In the Commons Tim Loughton, a Brexiter Conservative, says the remain campaign in the EU referendum set up no fewer than five separate pro-remain groups. The remain campaign funnelled £1m to them, he says. He suggests this is more serious than anything Vote Leave did. Loughton is referring to the allegations in this report on the Guido Fawkes blog. In response, Brake says any allegations about rule breaking by either side should be investigated. In the Commons MPs are now just starting an emergency debate on the allegations that Vote Leave broke election spending rules in the EU referendum. It is a two-hour debate on a bland motion, “this House has considered the EU referendum and alleged breaches of electoral law”, and it will probably go through on the nod at the end without a division. Tom Brake, the Lib Dem Brexit spokesman who secured the debate, opens by referring to the dossier about Vote Leave. He says it has been submitted to the Electoral Commission and the police. Frank Field, the Labour MP intervenes. He says he voted leave, but he believes in the rule of law. If the rules were broken, the “full weight of the law” should come down on those involved, he says. Henry Smith, a Conservative, also intervenes. He says that remain spent more than leave during the campaign, and that remain benefited from a £9m leaflet being sent to every home in the country. If the allegations in this report are correct, it shows there is something rotten at the heart of our democracy. Damian Collins says they have been going for almost four hours. He thinks that may be a record for a single-panel evidence session. He asks the witnesses if they have any final comments. Paul-Olivier Dehaye, the IT expert who has been giving evidence alongside Wylie, says they have been talking about how digital advertising affects individual. But there is a big question involving how rumours can influence people collectively, he says. He says only Facebook can do that work. Collins says the committee now needs to have a short, private meeting with Wylie. Ben Bradshaw (see 2.14pm) is in the committee room, watching the proceedings in person, I’m told. An MP tells Wylie that he has just read on this blog that Dominic Cummings has described Wylie as a “fantasist-charlatan”. (See 1.54pm.) How does he react? Wylie says he has worked with the information commissioner’s office, with the Guardian and the Observer, with Channel 4 News and with the New York Times. There has been a remarkable amount of fact checking, he says. He says if he is a fantastist, then all those other organisations are too. The Labour MP Ben Bradshaw, a firm remain supporter, says Christopher Wylie’s evidence today casts doubt on the legitimacy of the EU referendum result. Wylie says he has seen Cambridge Analytica pitch for business with companies close to the FSB, the Russian spying agency. He cites Lukoil as an example. Guy Verhofstadt, the European parliament’s lead Brexit spokesman, has posted this tweet about the hearing. Since we’re on the subject of Dominic Cummings, he has posted an update to his blog commenting on today’s evidence. He highlights this tweet from my Observer colleague. Q: Dominic Cummings describes you as a charlatan. That is unfair. But wouldn’t it be better to describe you as a failed Alexander Nix. You tried to set up on your own and it did not work like that. Wylie says he does not see himself as a failure. He is in the UK on a tier 1 exceptional talent visa. The UK government only gives out 200 of those a year. Q: But you pitched for their business, and now you are blowing the whistle. Wylie says he is not engaged in a vendetta for a pilot project that did not work out. He made the pitch as a favour. He had most of the material already. It did not work out. If Cummings had wanted to hire him, he is not even sure he would have been able to do the work. Q: You say you got reservations about what you were doing. Was that before or after you offered your data harvesting techniques to Vote Leave in January 2016? Wylie says he does not have qualms about data harvesting. You can do targeting in an ethical way. But at the time he approached Vote Leave, Trump had not been elected. He thinks it was at the start of 2016. Q: You are making an extremely serious allegation, that Cambridge Analytica was under-charging to avoid campaign finance rules. Do you have any evidence for that? Not in the form of documentation, says Wylie. But he says Robert Mercer was putting m to m to create an asset that the company was then licensing for ,000. He says he was subsidising the work of CA to the benefit of candidates and parties that he supports. Julian Knight, a Conservative, goes next. Q: You say you have seen an invoice from Cambridge Analytica to Ukip? Yes, says Wylie. He suggests he was shown this recently. Q: But Ukip has no money. Wylie says Cambridge Analytica does not need to make money. Robert Mercer can afford for it not to. And he says the figure on an invoice does not necessarily reflect the value of the work. He says Mercer puts money into the company, and the firm might then work for a political campaign. He says this allows campaign spending rules to be evaded. Q: So you would call it a fraud? Wylie does not use that word. But he says if Mercer puts om into political campaigns, that has to be declared. If he invests in a company, and it provides services for firms at below cost, that does not have to be declared. He is just putting money in as an investor. Q: There has been speculation about Facebook listening in to people’s conversations. Do you think that happens. Or is is just that they are so good at predicting what you want that it feels as if they are doing that? Paul-Oliver Dehaye, an IT expert giving evidence alongside Wylie, says Facebook are very good at hiding their targeting information. Wylie says this is really a question for Facebook. He says trying to analyse what people are saying could be difficult. But he says Facebook could benefit from accessing audio without having to listen in to conversations. For example, it could be helpful for them to know if someone was at the office, or at home, or watching TV. Collins says it is “astonishing” that Mark Zuckerberg is not prepared to submit himself to questioning here or before Congress. He says, if Zuckerberg has any concern for his customers, he should think again. UPDATE: This is from Catherine Miller, director of policy at Doteveryone, which is campaigning for a fairer internet. The SNP’s Brendan O’Hara goes next. Q: Did Cambridge Analytica work during the Scottish referendum? Wylie says he knows that Alexander Nix pitched for work during the campaign. But he is very “hazy” about the details. Labour’s Christian Matheson goes next. Q: What work does Cambridge Analytica do for the UK government? Wylie says it has mostly worked in Middle Eastern countries, doing research into people who could pose a threat. Q: Does this work include data being collected on British citizens? Not from what he’s seen, says Wylie. He says he is concerned that some CA staff who worked in Nigeria are now working for the UK government. Wylie says his understanding is that it was “common practice” for Cambridge Analytica to use tactics like hacking. Q: Are you accusing AIQ of illegal activity? Wylie says AIQ played a pivotal role in the scheme that was set up. Q: You are claiming breaches of electoral law, and intimidation by Robert Mercer. Should he be subject to investigation? He says this firm uses companies like Black Cube. (See 11.21am.) It is an intimidating firm. Q: You are convinced AIQ played a significant role, not just with Vote Leave but with other groups, and that you think those groups were connected. Wylie says he has provided evidence that BeLeave was based in the Vote Leave HQ. It reported to Vote Leave staff. So this was not just an informal relationship. He has concluded there was coordination. Q: Facebook became aware that its data was being used for political purposes. Did it know AIQ was using its data? Wylie says Hart would have to ask Facebook. He says he does not know if Facebook is aware of the relationship between AIQ and Cambridge Analytica. One consequence of having firms around the world with different names is that it makes it opaque knowing who did what. Q: Eldon Insurance deals with personal injury cases. There data would be personally sensitive. Are you saying there was a data breach? Wylie says he does not know that the relationship between Eldon Insurance and Cambridge Analytica. But he has seen Eldon Insurance documents talking about the success rate of Leave.EU marketing. He says he is curious as to why they had access to that data. He is not saying firmly that CA did have access to that data. But it is worth asking CA or Eldon Insurance about that. And was it using the insurance company’s data to target people. That is a fair question to ask, Wylie says. Jo Stevens says she agrees. Tom Watson, the deputy Labour leader and shadow culture secretary, says it will be “completely unacceptable” for Mark Zuckerberg to refuse to give evidence to the Commons culture committee in the light of Wylie’s evidence. Wylie says the ICO [information commissioner’s office] does not have much power. And it does not have many staff either. Wylie says it would be “a shame” if, by the time it were established that the vote to leave the EU was established by cheating, the UK had already left the EU. Wylie says the Americans still see Britain as a Downton Abbey country. From Steve Bannon’s point of view, if Britain could embrace Brexit, that would boost the chances of something similar happening in the US. Bannon was really interested generally in Ukip. He saw it as important for America because if you are fighting a culture war, Britain plays a key role in that. Because of the way Americans imagine British people – it is still Downton Abbey, everyone is posh, educated and refined – if you can instil a populist movement in Britain, in the American psyche that is validating – ‘If Britain is Brexiting, we can elect Trump’. Q: What about Cambridge Analytica’s work for Leave.EU? Wylie says CA are very good a using “weasel words”. He says it is worth asking whether Aaron Banks [the Leave.EU founder] used data from his insurance company, Eldon Insurance, to help the campaign. Labour’s Jo Stevens goes next. Q: Vote Leave spent 40% of their budget, or £2.7m, on AggregateIQ. And they were targeting 5m to 7m. That’s what I was told, says Wylie. Q: And the conversation rates [the success rate from internet ads] was 5% to 7%. For some projects, says Wylie. He says a conversion rate means people will perform a substantive action for the campaign. Q: In the end just 600,000 people decided the referendum. Dominic Cummings said this was small enough for just a few people to make a difference. So it is perfectly reasonable to say this made the difference. Wylie says it is “incredibly reasonable” to say the AIQ spending was very important. I think it is incredibly reasonable to say that AIQ played a very significant role in Leave winning. I have been updating some of the earlier posts with direct quotes, from the Press Association reports. To get the updates to show up, you may need to refresh the page. This is a company that has worked with hacked material, this is a company that will send out videos of people being murdered to intimidate voters, this is a company that goes out and tries to illicitly acquire live internet browsing data of everyone in an entire country. I think a lot of questions should be asked about the role of AIQ in this election and whether they were indeed compliant with the law here. Wylie says he gradually became more uncomfortable working for Cambridge Analytica. There was not a single moment when he decided to blow the whistle, he says. He stressed that Carole Cadwalladr, the Observer reporter who has published his revelations, has around 12 or 15 other sources too. He is not the only person speaking out, he says. Q: You have broken a non-disclosure agreement. Are you facing any threats? Wylie says the most legal pushback he has had has come from Facebook. They sent “some fairly intimidating legal correspondence”. Wylie says he worked for Cambridge Analytica, but paid for by SCL. Rebecca Pow, a Conservative, goes next. Q: You say CA made money through elections through “influence brokering”. What does that mean? And is there something more sinister going on here? He says firms do not make a lot of money from political consulting. If you help someone win an election, you get paid, but do not make a lot of money. But if you then introduce a minister to an oil company, you might get a get from a deal. He says when he was at CA, it was not just about selling influence. They would use fake government projects to help an agenda. Q: Are these people trying to be big power players? Yes, says Wylie. You can be like “a colonial master in a country”. You can go into a country with undeveloped civil institutions and make money from it, exploiting the lack of government oversight. Q: Are there other data analytics companies operating in the same way as Cambridge Analytica? Wylie mentions Palantir, a firm that worked for the US National Security Agency. He says Palantir used Facebook data. Wylie says GSR, the company run by the Cambridge psychologist Aleksandr Kogan, was set up purely to service Cambridge Analytica. Wylie says, if you can create a pyschological profile of someone more prone to certain idea, conspiracy theories, for example, you can then create a data profile for them. And you can then target them with advertising. They might then wonder why the mainstream media is not reporting what they are seeing. For example, they might wonder why the MSM is not reporting Obama moving troops to Texas as a precursor to trying to serve a third term. Q: Was that a tactic that was used? He says they asked how far they could go with certain types of people. This is from the Labour MP Ben Bradshaw. Wylie says AggregateIQ targeted between 5m and 7m voters during the campaign. It did not aim advertising at everyone. It was targeting people it could persuade, he says. He says online advertising often has a “conversion rate” of 1%. The AIQ success rates were much higher, he says. Q: Have you made any assessment as to whether this over-spending would have affected the result? Wylie says he has two points. First, if someone is caught doping in the Olympics, no one asks if that made the different to them winning the race. You should not win by cheating, he says. He says this vote made a fundamental change to the constitution of the country. Second, Dominic Cummings himself said the internet campaign was what made all the difference, he says. He says the “conversion rates” for the campaign’s online advertising were “incredibly effective”. He says it is perfectly credible to say that, without cheating, there would have been a different result. Wylie says Vote Leave “cheating” may well have swayed EU referendum result. Wylie says Grimes and Sanni were told by the Vote Leave lawyers what to do. Wylie says he is convinced that Vote Leave, BeLeave, the DUP and Veterans for Britain were working together in the EU referendum campaign. He says he can’t believe there would have been any other way they would all have found AggregateIQ. At that time you could not even find it on the internet. Wylie says he recalls someone at the AIQ office telling him what was happening was “totally illegal”. But they found it amusing. You have to remember this is a company that’s gone around the world and undermined democratic institutions in all kinds of countries. They couldn’t care less if their work is compliant because they like to win. For me it makes me so angry because a lot of people supported Leave because they believe in the application of British law and British sovereignty and to irrevocably alter the constitutional settlement of this country on the basis of fraud is a mutilation of the constitutional settlement of this country. He says BeLeave was used as effectively a money laundering vehicle. He says this happened because Dominic Cummings [who was running Vote Leave] was determined to win. He says he is very angry that two young people he introduced to Vote Leave’s Stephen Parkinson, Darren Grimes and Shahmir Sanni, were used to break the law. He says it is outrageous that Grimes is personally responsible for what is a criminal responsibility. He says these two young people were exploited. Grimes was even persuaded to give up university so that he could carry on campaigning for Vote Leave, Wylie says. Q: Alexander Nix told this committee that CA did not use Facebook data? Wylie says it is “categorically untrue” to say CA did not use Facebook data. Facebook data was the founding dataset for the company. That is what the company’s algorithms were based on. He says Nix’s comments to the committee were “exceptionally misleading”. More than that, they were “dishonest”, he says. Wylie says Cambridge Analytica boss’s evidence to culture committee about its use of Facebook data was “exceptionally misleading” and “dishonest”. Q: Can you say definitely that Cambridge Analytica shared its data with AggregateIQ? It depends what you mean by data. Q: Can you say AIQ had access to the data? He has provided documents to the committee that back this up. Damian Collins, the chair, says Wylie has given the committee a large stash of documents. The committee will be going through them. It may publish some of the material tomorrow. Collins says culture committee may publish documents from the Cambridge Analytica whisteblower tomorrow. Wylie says when he met Dominic Cummings in November 2015, Vote Leave did not even have any election data. He says shortly after that, Vote Leave hired AIQ. He says he thinks that is because they did not want to hire Cambridge Analytica because it was working with Leave.EU, the rival leave campaign. He says Cummings may have decided, if he could not hire CA, he would hire the next best thing. But that is speculation, he says. He says about two months later Vote Leave was able to obtain a large amount of voting data. He does not know how it got that. My question is where did you get that data? How do you create a massive targeting operation in a country that AIQ hadn’t previously worked in in two months? It baffles me as to how that could happen in such a short amount of time. Wylie says AggregateIQ (AIQ) played a role in a Nigerian election by distributing very violent videos intended to intimidate people. They showed people being dismembered, he says. The company utilised the services of an Israeli private intelligence firm, Black Cube. Black Cube on the Nigeria project was engaged to hack the now-president Buhari to get access to his medical records and private emails. FURTHER UPDATE: Black Cube has issued a statement describing Wylie’s evidence as a “flagrant lie”. See 4.23pm for the full quote. 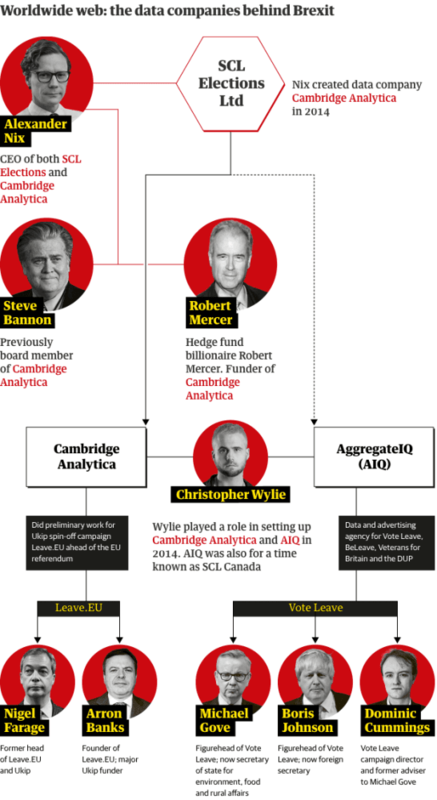 For reference, here is an Observer graphic setting out the relatonship between SCL, Cambridge Analytica and AggregateIQ. Wylie is now talking about the establishment of AggregateIQ, the Canadian firm with links to Cambridge Analytica. He says he found some experts he wanted to hire. But they were in Canada and did not want to leave. He discussed this with Nix. It was agreed that they would set up an operation in Canada. The intellectual property was assigned to SCL, he says. And the new company traded as SCL Canada. Q: What is the motivation for these people? Wylie says a lot of people at the top of the company are very rich anyway. He says Nix is wealthy. He once had to leave a meeting to pick up a £200,000 chandalier. But he says wealthy people like this need to have something interesting to do. Going into a country to influence its politics fills that need, he says. You have to remember that a lot of these people are very wealthy already. Alexander Nix in particular – there was one time when we were running late because he had to pick up a £200,000 chandelier. These are people who don’t need to make a lot of money, but the thing that I learned is that for certain wealthy people, they need something to keep them occupied and they need projects. Going into the developing world and running a country is something that appeals to them. Wylie says Alexander Nix became involved in the company because his father had shares in it. He says Nix had no background in tech, or pyschology, or politics, or any other core features of the business. But Nix was a specialist at sales, he says. Q: Your predecessor died in Kenya. Were there any suspicious circumstances? Wylie says he has heard various different stories as to what happened. He does not know what happened. But in Kenyan politics, if something goes wrong, you can pay for it. He says there was news coverage in Romania because the colleague, Dan, was the son of a Romanian politician now in jail. Wylie says the colleague was called Dan Muresan. Wylie says, when he was taken on, he was not told that his predecessor had died in Kenya. Q: So what were you told? Wylie stresses that what he was told was pure speculation. He was told that Muresan was working with a politician. In those circumstances you are not paid for your work, but you can win contracts afterwards. He says he was told that the deal went wrong and that Muresan was poisoned in his hotel room. He says he was also told that the police were bribed so they did not enter the hotel room for 24 hours. People suspected that he was poisoned in his hotel room. I also heard the police got bribed to not enter the hotel room for 24 hours. That’s what I was told. I was not there so I can’t speak to the veracity of that. But he stresses that he does not know whether these claims were true. Labour’s Paul Farrelly goes next. Q: So your main motivation is concern that techniques developed for military use are being used to influence elections? That is part of it, says Wylie. But he says he is also concerned that Cambridge Analytica goes around the world undermining institutions. It is “what modern day colonialism looks like”, he says. It is going into countries struggling to get off the ground and undermining their institutions. Q: So is it like Smersh from James Bond [although Farrelly seems to be calling it Smash]? Wylie says the Channel 4 undercovering filming told its own story. Q: Is it true that Steve Bannon came up with the name Cambridge Analytica? He says Alexander Nix, who was head of CA until he was suspended, has a standard sales pitch. It involves his posh veneer. But that did not play well with Steve Bannon. Nix realised that, Wylie says. So he decided to set up a “fake office in Cambridge” to present a more academic image for the company. It was as a result of that the Bannon decided the company should be called Cambridge Analytica. He liked the academic image. Q: Did you have a formal relationship with Cambridge? Not formally, says Wylie, but he says the firm worked with a lot of academics. Cambridge has a very good psychology department. The company worked with some of those specialists. Q: Why have you decided to speak out about your former colleagues now? Wylie says people have duties as citizens. People ask why it has taken him so long to speak out. But he has been working with the Guardian on this for a year. And he has been working with the ICO [information commissioner’s office]. He also signed non-disclosure agreements. He was worried about being sued into oblivion by Robert Mercer, the billionaire part owner of Cambridge Analytica. He also says that it has taken time for him to realise the political implications of the work he was doing. He started speaking to the Guardian after the election of President Trump. As a citizen, one has a duty to report unlawful activity,” he said, explaining that he came forward shortly after the inauguration of Donald Trump. I wouldn’t say it’s just because of Donald Trump, but Donald Trump makes it click in your head that it has a much wider impact. I don’t think that military-style information operations is conducive to any democratic process. Q: Are SCL and Cambridge Analytica effectively the same organisation? Christopher Wylie says that is the case. Damian Collins, the Conservative chair of the committee, opens by saying Mark Zuckerberg has responded to the committee’s invitation to give evidence. He says Zuckerberg has proposed that Chris Cox, Facebook’s chief product officer, gives evidence. The committee will set that up for after Easter, he says. He says the committee still thinks Zuckerberg should appear. It was not clear from his letter whether he was refusing, Collins says. He says the committee will write to Zuckerberg again, repeating the request for him to appear. Collins says committee will renew its request to Zuckerberg for him to give evidence. UPDATE: Here is the statement. Facebook founder and CEO Mark Zuckerberg has told the culture committee he will not give evidence to its inquiry in to fake news, but has “personally asked one of his deputies” to attend, the Press Association reports. Christopher Wylie, the Cambridge Analytica whistleblower, is about to give evidence to the Commons culture committee. He will appear alongside Paul-Olivier Dehaye, an IT expert. The migration advisory committee was asked last year to produce a report on how much immigration the UK would need after Brexit. It has published an interim report (pdf) this morning. Immigration from Europe does not seem to have pushed down wages, the MAC says. We found no evidence that EEA migrants are more likely than the UK-born to be paid less than the minimum wage though there is some evidence this is the case for non-EEA migrants. These pay gaps do not imply that EEA migration has reduced the wages of the UKborn. The UK has experienced a period of declining real wages in recent years, the worst decade according to some estimates for over 200 years. 2 The timing of this seems more closely linked to the financial crisis than the expansion of the EU in 2004, and has affected UK-born workers of all skill levels, not just those in lower-skilled jobs where the increases in EEA migration have been concentrated. For our final report, we are updating and extending previous analyses of the impact of migration on wages but previous MAC reports3 have concluded that migrants had little or no impact on average wages, but increased wages at the top of the UK wage distribution and slightly lowered wages at the bottom of the distribution. Employers say restricting immigration after Brexit will be bad for the economy, the MAC says. Many employers argued that restricted access to EEA migrant labour would have negative consequences for their businesses and the wider UK economy, either by restricting companies’ ability to grow, or forcing firms to relocate to Europe in order to access EU labour without restrictions, or forcing some employers out of business. Employers do not deliberately set out to fill vacancies with immigrants, the MAC says. The vast majority of employers do not deliberately seek to fill vacancies with migrant workers. They seek the best available candidate. When an EEA migrant worker gets a job, it is because the employer thinks they are the best, sometimes the only, qualified applicant. It is important to realise that the difference in skills within the population of both migrants and the UK-born is far larger than any difference between the groups so that it can be misleading to think of migrants and the UK-born as distinct but homogenous groups. 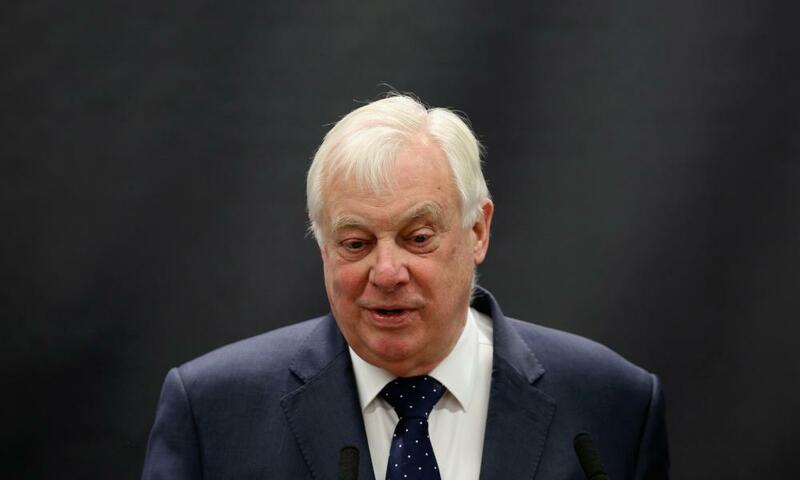 Lord Patten, the Conservative former cabinet minister and former European commissioner, is giving a speech this morning on Brexit. Patten is as anti-Brexit as Tony Blair (see 9.23am) and in an article for the Times (paywall) previewing his arguments he mocks the Brexiter argument that leaving the EU will be good for trade. Independent countries do fewer deals than the EU and the deals are not as good as those made by 28 countries acting together, with the bargaining power that being a market of more than 500 million people brings. The Global Britain touted by some pro-Brexit ministers (as though we had not been global for centuries) is not only hypocritical, it is also political and economic nonsense. One problem is that the ministers who talk about these fictitious trade deals have never negotiated one. The closest they have come to a trade deal is the checkout at Waitrose. The Germans inside the European Union send two and a half times as much to China as we do. Our main interest in doing more business with China would be to break into services. And the Chinese are very, very closed about services. The Chinese, if they were going to expand services with us, what it would actually mean is more Chinese tourists, which would mean an easier visa access for Chinese tourists. The Chinese have just done a trade deal with Switzerland. It hardly covers services, except under General Agreement on Tariffs and Trade terms. It does cover trade in manufactured goods a bit, but only to the extent that the Chinese have immediate tariff-free access to Switzerland; the Swiss have to wait 15 years to get tariff-free access. The problem is, if as a single country you get in bed with an elephant, you tend to get squashed. Patten said he thought the UK would be better off staying in the EU but, that if it had to leave, it should stay in the customs union. Labour has taken too long to stamp out antisemitism in the party, the shadow business secretary, Rebecca Long-Bailey, said today. As my colleague Matthew Weaver reports, Long-Bailey said it was imperative for the party to urgently address the problem to ensure that the Jewish community felt welcome. Tony Blair is one of the most outspoken opponents of Brexit in British politics and last night, in a speech in parliament at Speaker’s House, he reaffirmed his call for voters to have the chance to have the final say on leaving the EU or remaining, in a second referendum once the terms of exit are known. And he urged MPs to insist on a second referendum, saying there should be a proper “meaningful” vote in parliament, not just the take-it-or-leave-it vote promised by ministers (with the UK leaving the EU with no deal, if MPs vote down what’s on offer). As for the Conservative party, I understand why they feel they must deliver Brexit as ‘the will of the people’. I understand also why they believe that delivering it is the best inoculation against a Corbyn government. But in politics the difference between tactics and strategy is everything. Tactics are about the politics of the moment. Strategy leaps over the moment and tries to imagine the long term. Think ahead. Before the end of 2020 we will know the real deal. I suspect we will have a Canada type deal with not much plus. And if we don’t, we will have a deal which will leave a big number of Brexiteers feeling hoodwinked. There is then another 18 months to an election. Think June 2022. Will the economy be stronger? Will the Brexit news be better? Will people be feeling that Brexit has really delivered all that ‘control’ we say we don’t have now? Will the NHS be on the mend? Will the free trade agreements be stacking up? Brexit happening in this sequence will be a Tory Brexit, fully owned, exclusively and completely by the Conservative party. The 17m who voted ‘Leave’ may be short on gratitude. The 16m who voted ‘Remain’ will be unlikely to forget. Remember that 13m wins an election. Brexit is not the route to escaping a Corbyn government; it is the gateway to having one. But there is an obvious weakness in his position; if he wants the Labour front bench to take a firmer stance against Brexit, saying that Brexit is the gateway to a Corbyn government is not the best argument to deploy to win them around. We’ll get more Brexit today when Theresa May gives evidence to the Commons liaison committee. 10am: Sir Michael Barber, chair of the Office for Students, gives evidence to the Commons education committee. 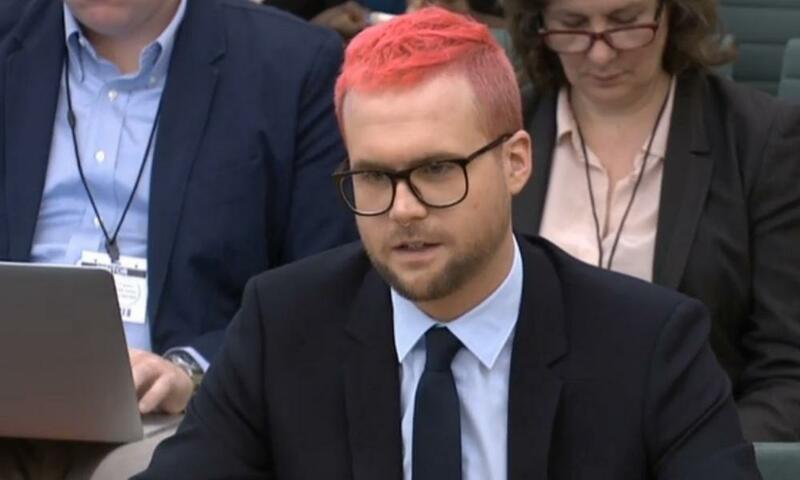 10.30am: Christopher Wylie, the Cambridge Analytica whistleblower, gives evidence to the Commons culture committee. 11am: Jacob Rees-Mogg, the Tory Brexiter, gives a speech on Brexit to Leave Means Leave. 11.30am: Boris Johnson, the foreign secretary, takes questions in the Commons. Around 12.45pm: MPs begin a two-hour emergency debate on the allegations about Vote Leave breaking election spending rules during the EU referendum. 4.30pm: Theresa May gives evidence to the Commons liaison committee. As usual, I will be covering breaking political news as it happens, as well as bringing you the best reaction, comment and analysis from the web. I plan to post a summary at lunchtime and another in the afternoon.